All of this had to take place in an innovative and inspiring environment. In collaboration with client Roularta, Pieter Voet designed the whole set spanning a total width of 40m. Using a combination of widescreen projection, multiple LED screens and 30 pixel mapped moving heads he managed to create an expanding look giving a wide feel but still keeping the audience’s attention on the stage where the magic was happening. After the design phase the right technology and equipment was selected together with Dries Mees - the main video engineer for this project. One of the key decisions they had to made, was which media server to use. Looking at the specifications of the d3 4x2pro, the decision was easily made. Driving a canvas of 10040x1080 pixels was no problem, pixel mapping the moving heads in full 19-pixel mode was easier than expected and above all: everything could be prepared and tested before even arriving at the venue. During the load-in and the event the d3 media server proved its worth many times. In a matter of minutes, all lighting fixtures were mapped and the feeds were sent to the projectors and LED screens. Even last-minute requests such as playing clicktracks in sync with the video were no problem. Then it was all a matter of loading in the latest versions of the content and rehearsing the show a couple of times. 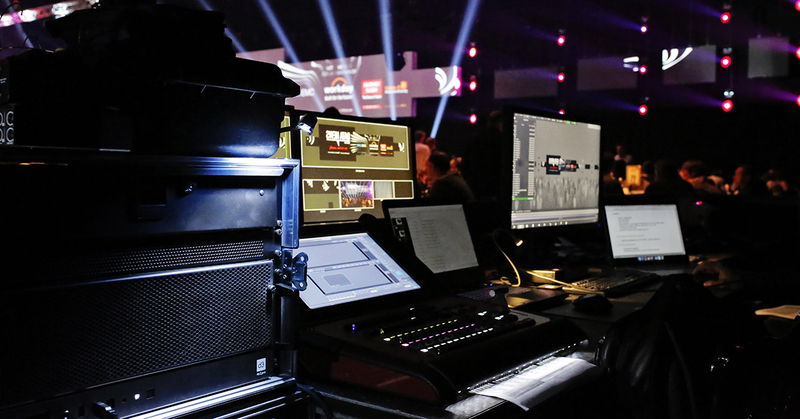 "The d3 proved to be a key component in solving the technical challenges for this project, leading to a happy customer and an even happier show crew. This will certainly not be the last time the d3 media server will join D-Dream at an event", concludes Pieter Voet from D-Dream.